Thank you very much for your advises. That help me another method to handle the description from many windows. But what I request is difference, I would like to request some feature that help new user for IQRM software to be able understand the file easier. In 2009 one engineer do the FMEA by IQRM for rear seat assembly then he change his job. In 2010, I modify one process, I need to add one detection actions in to the failure. In this case I am happy because the file was made in the good way, each detection action has it specific name. So, I can include an existing detection actions (sensor) into the failure easily. In this case, I don’t know what is the Visual checks , are they the same or difference. 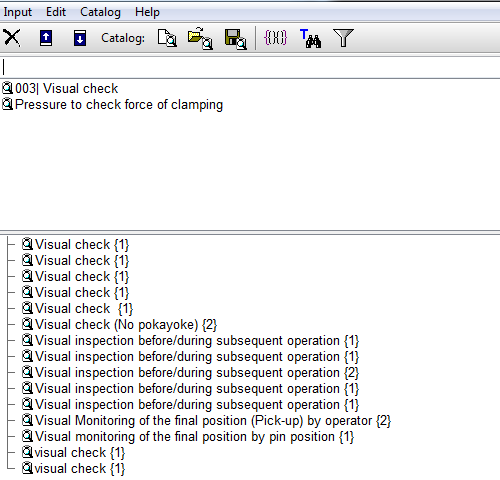 I would like to have the way to see if Visual check line 1 or line 2 or line 3,…. link to my failure case. Is this possible to have in new feature or not? Although opening ‚Data Manager‘ it does not help much. Even I try to manage them, to combine all Visual checks as one Action, I still have problem because some of them may difference, I don’t have the feature to know easily where do they link to. I think ‚Data Manager‘ or the ‚Input Collector with Catalog‘ should have the display to show more detail.